With the new range of Millenia Sport safety eyewear from Sperian , safety in the workplace has never looked better. Leader in personal protective equipment, Sperian, has designed this new sophisticated safety eyewear to offer wearers a balanced fit and greater visual comfort, while providing outstanding visual protection against a wide range of hazards. Representing the next generation in safety eye protection, Sperian Millennia Sport safety eyewear combines a lightweight dielectric value frame with a medium impact dual 9-base wraparound polycarbonate unilens for superior side and brow protection and optimal safety performance. The polycarbonate lenses can also be coated in an anti-fog or hardcoat, and the Sperian Millennia Sport range is available in clear and TSR grey lens tint options. 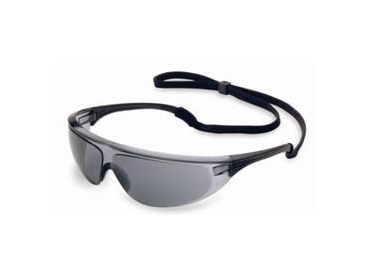 Sperian designed these safety glasses to have a comfortable universal nose bridge, which ensures an optimal fit for a broad range of facial profiles, and all day long wearing comfort. For added safety when working, Sperian Millennia Sport safety eyewear comes standard with an adjustable break-away Flexi-cord retainer. Designed to be worn for both mechanical work and general use, Sperian Millennia Sport safety eyewear can also be worn outdoors to combat eye fatigue as it provides 99.9% UV filtration protection.